On a map, it’s marked Point Pedernales or Honda Point, but to mariners who know the hazards, it has always been and will forever remain the “Devil’s Jaw.” Here, on a shallow reef peppered with menacing volcanic pinnacles, seven destroyers were lost on September 8, 1923, in one of the U. S. Navy’s worst peacetime disasters. Cruising from San Francisco, to their home port in San Diego, nine in a fleet of 14 destroyers followed the lead vessel and crashed on the rocks of Point Pedernales, Southern California. As two of the ships backed off and limped away, 23 sailors died in this dark episode of naval history. Many of the 800 survivors were commended for their rescue efforts during the ensuing debacle as they helped victims in distress. 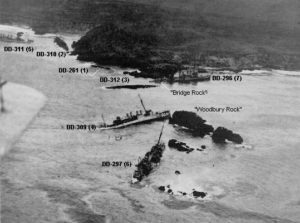 Local fishermen took crews off the USS Fuller and USS Woodbury, while ranchers set up breeches buoys from the top of nearby cliffs. Good Samaritans from Lompoc, a coastal town 15 miles north, brought food, clothing and blankets to the scene. The accident happened when the leader, flagship USS Delphy of Squadron Eleven, made a wrong turn while engulfed in a heavy fog. The captain and his navigator thought they were further south and entering Santa Barbara Channel. They relied on dead reckoning rather than radio direction finding (RDF), the navigation system used before radar was introduced. Locally known as Honda, the site of the tragedy was called “Devil’s Jaw” by Spanish sailors who feared the rocks, winds, waves and currents there. The area off Honda and nearby Arguello, Conception and Rocky Point is part of the “Graveyard of the Pacific.” Dozens of other wrecks lie in the Santa Barbara Channel and along the offshore islands. Like tenpins colliding on a bowling alley, the USS Delphy, USS S.P. Lee, USS Young, USS Woodbury, USS Nicholas, USS Fuller and USS Chauncey struck the shoals or each other and sank within five minutes. The damaged USS Farragut and USS Sommers backed off into deeper waters. The USS Young took the worst hit and rolled over. Although there were many dramatic rescues by shipmates, 20 of this vessel’s seamen died. Among the heroics, Chief Boatswain’s Mate Arthur Peterson leaped into the swirling sea and swam 100 yards to the USS Chauncey where he attached a heavy line to a lifeboat. More than 30 men were saved in rescue trips made between the ships. Peterson and scores of others were later cited for leadership and bravery. Seven “Greyhounds of the Sea”—a pet name for their sleek design and speed—or “tin cans” named for their thin steel hulls, were now on the Navy’s “Ships Lost at Sea” list. 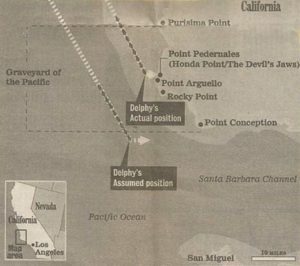 A Navy Court of Inquiry registered the disaster as “a bad error of judgment and faulty navigation” aboard the USS Delphy. It asserted that the other ships’ masters had put “too much blind faith in the squadron commander and took little initiative in determining their own positions.” A General Court Martial, held at naval headquarters in San Diego, found Commander Donald T. Hunter and Capt. Edward H. Watson guilty of “culpable inefficiency and negligence.” Both were released from arrest and returned to duty with stipulations that no future promotions were possible during the remainder of their careers. Ten other officers charged in the court martial were exonerated. In the aftermath, the American public remained dubious, questioning whether or not all information on the Honda miscue had been revealed. The Navy was suspected of a cover-up, but subsequent civic probes did little to dispel the doubt. Ironically, official records of the findings and opinion of the Court of Inquiry disappeared from the Judge Advocate General’s office not long after the proceedings ended. 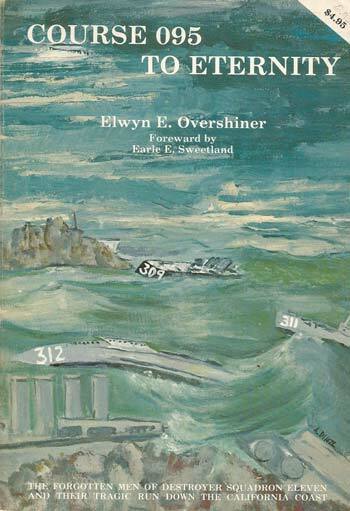 One of several books compiled on the incident was written by the late Elwyn E. Overshiner of Santa Rosa, California, who spent a 30-year civilian career with the Department of Defense. His interest in the Honda disaster was two-fold: he felt the Navy put the incident on the back burner and extended only token memorials; his brother, Fireman Gordon J. Overshiner of the Young, was one of the 23 fatalities. Diving on the remains of Squadron Eleven is a touchy subject. After the Navy went through the wreckage recovering armaments and munitions, salvage rights were sold to Merritt, Chapman and Scott. But the company didn’t realize the gargantuan task it faced while hemmed in by the steep cliffs on one side and the rocky terrain seaside. Thus many “goodies” were left for California’s wreck diving brass hounds that got their share before the Honda Point site was declared off limits to civilians. Vandenberg Air Force Base and the Naval Missile Facility at Point Arguello own the 35-mile-long, 100,000 acres of land along the coast. The sea remains a Marine Protected Area (MPA) where diving, fishing and other activities are banned. The Honda hulks are by no means an ideal dive site. Visibility is 0 to 35 feet depending on winds and currents. Conditions deteriorate quickly when the surf’s up. The vessels, embedded in the sand in waters 8 to 40 feet deep, barely break the surface on ebb tides having taken a pounding by fierce weather patterns over the years. I enjoyed your article about the ‘Devil’s Jaw.’ Some years ago, was there a controversy in court where recreational divers sued the Navy in order to dive the Honda wrecks? Thank you. It was an interesting shipwreck to research. Yes, I heard that years ago one of the members of the California Wreck Divers Club brought a suit against the Navy, actually the government, asking that a ban on recreational diving be lifted from the Honda Point site. To the best of my knowledge, nothing ever came of it. If any people have further information, I would appreciate their comments.